I had been in Panama just three days when I noticed some optics stood in the corner of the Canopy Tower dining room at lunchtime. Not the normal tripod dangling a scope, but just about the biggest lens hood I have ever seen, like a cowled monk about to burst into evensong. Over lunch its owner, John Afdem introduced himself. “How long have you been a birder?” I asked and was taken aback by his reply, “I’m not a birder, I’m a photographer”. Over an enjoyable meal with many swapped anecdotes and cold drinks he explained that, to him, the image was everything. He loved the birds but unless he managed to get a shot of one it just ‘didn’t count’. He was no photo-lister, if such a term exists, just totally focused on his art. This single-mindedness seemed to be a feature of the man who is Chief Financial Officer of an international company and whose past pursuits like scuba diving and flying were all undertaken with total commitment and enthusiasm… I knew well before I looked up his photo-collection on the net that such full-on focus would result in brilliant images. With other new friends we had long conversations here, and later when we met up again at the Canopy Lodge, about birding, birds and the beauty of the wild world. What stood our as prominently as the backside of a Lemon-rumped Tanager, was that birding and birders are almost as varied as the birds themselves. Three contrasting aspects of the trip really struck me. First was what I call, ‘the walker versus the stalker’. Those of you who know my ‘Fatbirder’ or ‘grumpy old birder’ personas will know that an accident in my youth and chronic disease has made walking difficult for me and my indolence and corpulence render if totally undesirable. So by nature and nurture I have become a sedentary birder. On overseas trips I plan for these restrictions, so the majority of my birding is from or close to a vehicle. Notwithstanding the occasional serendipity of a ‘good’ physical day and a lifer that simply will not come to me when I have been known to walk a trail or two, I have found my technique almost as productive as any other. Some birders will charge off on a 10-mile hike believing it to be as good for their soul as it is for their soma, regardless of how this bush bashing may scatter shy birds before them as surely as a peregrine puts up pigeons. Ocellated Antbird Phaenostictus mcleannani – another secretive leaf-litter skulker this antbird is rarely seen away from antswarms – but stunning when in a shaft of sunlight. Secondly, regardless of means, some birders are happy to settle for Spartan or even sub-standard accommodation in pursuit of a long list whereas softer souls, especially greybeards like me, have been known to forgo endemics in exchange for air-conditioning. Thirdly, and new to me, was that some people pursued the perfect picture even to the exclusion of seeing new species, that for some the image is everything. One of the early exchanges with John was that 30 years ago I had found myself off Fiji in a glass-bottomed boat snapping away on my basic camera when I was suddenly frozen by irony. Instead of enjoying the experience I was recording it – the experience itself was second to the laying down future memory nudgers. I laid my camera aside then and have rarely bothered with it since. I never got round to asking John whether the birds or the camera came first but his love of the great outdoors is probably sufficient to explain both. We did exchange email addresses and even before leaving for home he was downloading his pictures for me to see, and, its easy for me to say, they are certainly worth all the hard work and long slogs it took to produce them. Black-throated Trogon Trogon rufus – (Sometimes called Yellow-bellied Trogon) – the ‘rufus’ latin tag refers to the colour only found on the females tail. What made you choose Panama as a birding photo destination? I’ve been to Costa Rica six times already, and was looking for something new. I looked at Ecuador and Colombia, but went with Panama as it’s such an easy flight (I could leave my home in the morning and be shooting late afternoon on location) and the tourism industry is more developed and so I felt more assured that I’d get what I wanted out of the trip. Did it live up to expectation? It exceeded my expectations. The locations, both the Canopy Tower and the Canopy Lodge, were phenomenal. Superb guides and superb birds (and other wildlife). I’ll be back! How would you now rate Panama for a photobirder? It’s outstanding. The birdlife seemed both more varied and more concentrated that what I’ve experienced in Costa Rica. Apart from the bird life what else had your photography juices rising? I got some great shots of both species of sloth, and was able to experience my first army ant feeding swarm. It was mind-blowing. It took me 5 minutes to start shooting as there was so much happening that I couldn’t figure out what to focus on (both figuratively, and literally!) Landscapes, flowers, lizards, frogs, insects, Panama has it all. What was the bird you saw that you would most like to have had better shots of? Squirrel Cuckoo. I’ve got some great shots of that bird, but I’m still looking for that classic pose, facing me with the tail down and in full view. I also would have liked better shots of the Green Shrike Vireo – a ‘crazy-making’ bird that sits just below the canopy in the shadows and sings and sings and sings but is pure HELL to spot, or image. When it comes to photographing birds are you a walker or a stalker? Tough question Bo. I’d have to classify myself as a walker-stalker. I move, but I move slow and I keep all the senses on high alert for movement, sounds – a lot of times a flicker of shadow is the first clue to activity. When I think or determine something is there I stop and work it. What was the bird that gave you most pleasure filming? Definitely the ant-birds on the army ant swarm. Ocellated, Bi-colored, and Spotted Antbirds, all on the swarm along with about a dozen less colorful birds; wood-creepers mostly. It was really tough shooting, very low light, but I came away with some captures that are beautiful of difficult birds to see, much less photograph. Its definitely a tie. The Spot-crowned Barbet was a new species for me; its a stunning bird, and one I didn’t know even existed, and I got great images of both the male and female. The same goes for the Barred Puffbird. A rarity even in Panama and after some work, I got photographs that are world-class images of that truly beautiful bird too. Was there any bit of kit that you really regret not packing? No, most of the time I regretted the weight of the gear I did pack!! I lug a lot of gear, spending many days in the field carrying both an 800 and 300mm lens and 2 or 3 bodies, along with tripod, flash, etc. The bit of kit I really need is a solid and uncomplaining sherpa! When being guided what is most important thing a guide can achieve for you? Shining Honeycreeper Cyanerpes lucidus – Generally a bird of forest edge this does well at semi-urban feeders. So, on the walker or stalker front it seems that most photographers will want to use a bit of both, especially those who get in place under cover and wait for the bird to turn up. Like any sort of birding luck plays a big part; we all know anything can turn up anywhere. I ‘took off’ an afternoon when we first moved from the Canopy Tower to Canopy Lodge. It was ideal for indolence with big leather rocking chairs on a veranda overlooking a garden full of fruit feeders and colourful plants. I was less than 30 feet from the birds; warblers and euphonies, tanagers and motmots, woodpeckers, thrushes and hummers. Amazon Kingfisher sat on a bare branch in the garden overlooking the adjacent stream. A few minutes later no less than 5 Collared Aracaris came down on the feeders and gorged on bananas. When the Lodge’s owner joined me he told me that neither the Kingfisher, nor the Aracaris had ever been into the garden before… timing and luck! Mind you I had marked down the puffbirds as ‘top wants’ before embarking on the trip – partly as they are handsome fellows and partly because they are a family I had never seen before. John had to work very hard to see the Barred Puffbird but it was impossible for me. But serendipity and patience do pay off too, as I had amazing views of a Tiny Hawk taking and consuming a White-necked Jacobin as I sat at the feeders on the deck of the Canopy Lodge, many birders around at the time never connected with this superb little raptor. 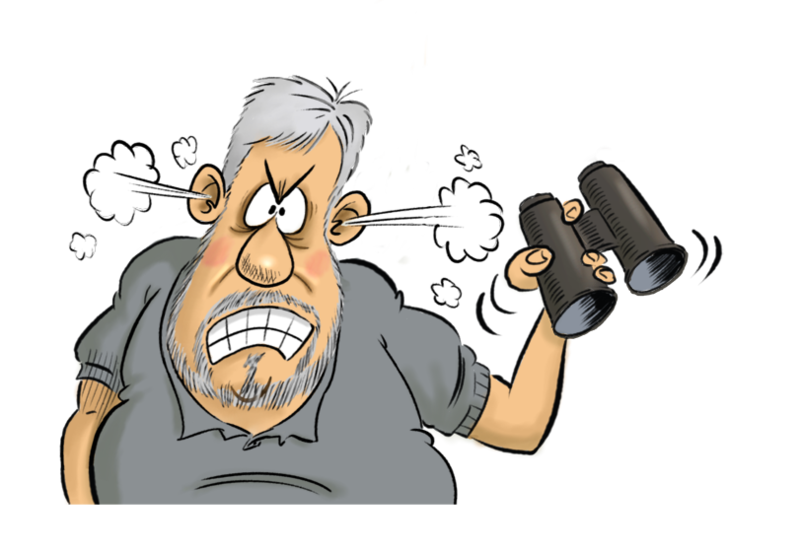 On those days when we trundled down the Pipeline Road in our tourist mobile – an open flat-back pickup with seating – we often passed by red-faced and sweaty birders walking the five or six kilometers that we drove. The movement and noise of the vehicle didn’t stop us from seeing Giant Jacamars from six feet or the shy ant-wrens and other rainforest denizens. Overall I must miss a handful of birds but with my incredibly sharp-eyed birding companion [Maggie always spots raptors before the guides wherever we go] I often get birds that fitter birders miss so it nearly always evens out. Overall Panama was a revelation. It’s hard to remember what I expected but I can report that people are generally friendly and helpful, the infrastructure is good and the birding stupendous. Rainforest, cloud forest, riverine and wetland, suburban and agricultural habitats, all abounded with birds; its got the lot. I even managed a lifer from the hotel in Panama City the night before we flew home… the breathtaking view of the Bridge of the Americas over the Pacific Canal entrance, with ships anchored as they wait their turn and the lively marina made for a pleasant enough vista, but the waders on the mudflats were even better as they extended my Panama list by a dozen species. The highlight, however, was a Blue-footed Booby sitting amongst the prehistoric looking pelicans frigate birds on an abandoned jetty! When I asked John what his top bird was he threw the question back at me and really put me on the spot. I loved all the wished for birds like Jacamars, motmots, puffbirds and trogons. I thrilled at the striking and colourful toucans and barbets and Cinnamon Becards are hard to best. To be fanned by the wings of angels [well cooled by the beating wings of two dozen hummingbirds to be more accurate] takes some beating. But for me two small birds are hard to split as the top for the trip… Canada Warbler [because I dipped on it in Canada] and Barred Antshrike. I’ve seen these chaps before and, being black and white, they cannot be called colourful. Nevertheless, their striking tight barring is as stylish as a pair of Gucci shoes and far, far more appealing. We flew with BA to Houston [as we had business there] and then took a Continental Air flight – flights to Panama City fly out of several US hubs. I strongly recommend a birding package that includes pick up from Panama City. The road system is very good – but if our cab ride to the airport [having stayed over night in Panama City] was an ‘experience’ with some real Mach driving. In the country areas there was little traffic and excellent roads. Panama is the fastest growing economy in Latin America and we saw little poverty. The currency is not the US dollar, but has one to one parity so US Dollars are accepted everywhere and there was no shortage of ATMs. The Lodges catered well for me as a vegetarian but at the ‘international’ hotel we stayed at in the city it was unheard of. US, Canadian and Western Europeans do not need a visa. Spanish is the official language but most people speak some English. You are in the tropics so expect it to be hot and humid day and night but both the locations we stayed at were very pleasant both being elevated and the Tower having cooling breezes. It can rain even outside the rainy season but it is usually short in duration albeit heavy. Crime is low compared to many Central American countries and claims to be the safest country in Central America, but the usual precautions are recommended against opportunist theft and ‘express’ kidnapping where people are forced to use cards at ATMs then released. Crimes against tourist carry a premium sentence. In the Canal Zone and adjacent areas there is no Malaria so prophylaxis is not needed… anyone contemplating the border areas should seek medical advice. When walking through forest there can be venomous snakes including Fer-de-lance and Bushmaster… but snakebite is uncommon and health facilities good. The ‘Dry Season’ runs Mid-December through May. October and November are the most rainy with rain expected most afternoons. December [the greenest month] through February has the advantage of the best weather and many North American migrants – we saw a great many North American Wood Warblers.